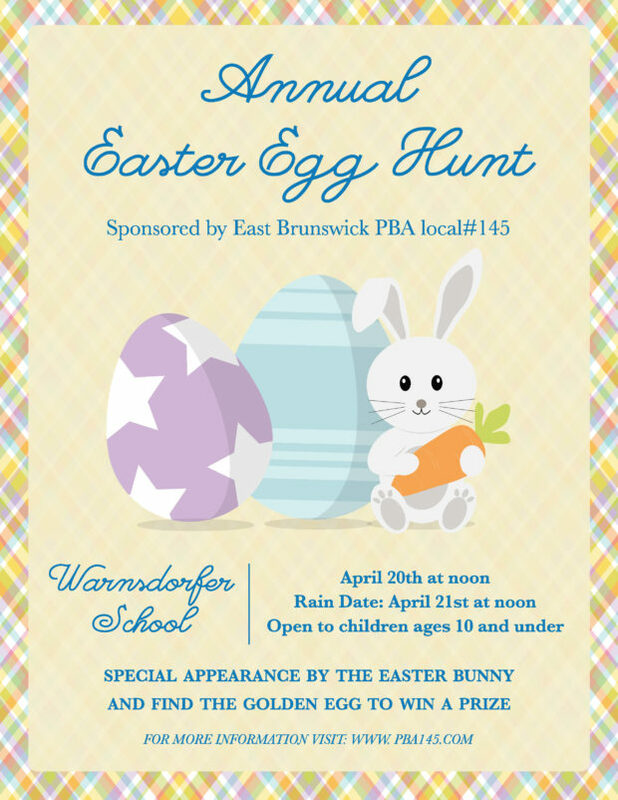 The East Brunswick PBA #145 will hold its annual Easter Egg Hunt on Saturday, April 20, 2019 at noon. The event will be held at Warnsdorfer School located 3 Hardenburg Lane, East Brunswick. The Easter Egg Hunt is free of charge and open to the public for all children 10 years of age and under. There will be a special appearance by the Easter Bunny. Find the golden egg to win a special prize! In the event of rain, the Easter Egg Hunt will be held Sunday, April 21st at noon. Visit www.PBA145.com/egghunt2019 for registration information. Posted in Events and tagged bunny, easter, egg, hunt, pba.